“Who says size doesn't matter, baby?" a rotund Adnan Sami drawls as he's featured on the Hot Seat (or some similar honour) of some Hindi music channel that I can't remember right now. Just switch on Star World and you'll see the truth in his words. The fabulous fat guys have taken over the comedy corner. Let's take a closer look at three of them. You've seen him on King of Queens, and recently, he's been making everyone smile with his bumbling, well-meaning, and utterly comical antics in Will Smith's romantic comedy Hitch. Kevin was born Kevin George Knipfing on April 26, 1965. He attended Cortland University where he played fullback on the football team while majoring in sports management. He realised after 3 years that this wasn't the path for him. After returning home, he decided to go back home and to break up the monotony of the summer, he joined a community theatre. During a play in which he had a comedic role, he so enjoyed the crowd reaction, that he joined his brother's (comedian Gary Valentine) improv group. He began going to clubs with Gary and realised he, too, had the knack for comedy. He has performed stand-up up for about 11 years. It was on the comedy circuit that he met Ray Romano. While Ray was getting a big break with his own sitcom, Kevin was getting recognition on Star Search (1983). After appearing on The Tonight Show with Jay Leno (1992), his big break came at the 1996 Just for Laughs Montreal Comedy Festival. Afterward he landed a recurring role on Ray's sitcom, Everybody Loves Raymond (1996). He has since received his own sitcom The King of Queens (1998). In this popular sitcom, he plays parcel deliveryman Doug Heffernan, who shares a home with his lovely wife in Queens, NY with Carrier's oddball dad, Arthur (Jerry Stiller). Burly Doug, who makes a living as a parcel deliveryman, often has to scheme to find time alone with Carrie, as Arthur can be quiet a handful, so much so that they hired a dog-walker, Holly, to look after him. When he's not working, clashing with Arthur, or nesting with Carrie, Doug hangs with his advice-giving buddies Deacon (Victor Williams) and Spence (Patton Oswalt), as well as his cousin Danny (Gary Valentine). 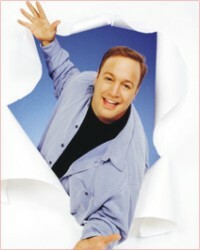 This funny fat man has so much of the laugh stuff to give out, he had two shows running back to back on Star World. Drew Alison Carey (born May 23, 1958) is an actor and comedian famous for his black-rimmed glasses. A former United States Marinereservist, he adopted his trademark crew cut during his time in the service. 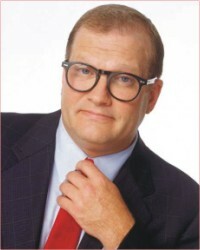 After a period spent performing stand-up comedy and supporting roles on a number of television shows, he was given his own sitcom on ABC, The Drew Carey Show, in which he plays the assistant manager of personnel at a department store in Cleveland, Ohio. Carey also hosts the United States version of the improv comedy show, Whose Line Is It Anyway? For The WB's 2004-2005 prime time schedule, Carey co-produces and stars in Drew Carey's Green Screen Show, an improvisational comedy spin-off of Whose Line Is It Anyway? Mark Addy isn't one of that men who are obsessed with his size, completely the opposite to his character, Dave, in The Full Monty, where he played a guy who was literally a knot of insecurity, obsessed and in low self esteem. As he says, "In fact, if I lose weight, I'm sure I wouldn't get good parts, 'cos I prefer character parts". Mark Addy has a long career in theater, in which has developed very different characters. In 1988 he appeared on TV for the first time, in a couple of chapters of BBC's A Very Peculiar Practice. His next TV appearing was in 1995 in Ghostbusters of Each Finley and Band of Gold. Then, in 1996, he joined as a regular the cast of A Thin Blue Line, a police comedy where he co-starred with Rowan Atkinson, well known worldwide as Mr. Bean. Still on TV and still at BBC, he starred the series Sunnyside Farm. Later he filmed a TV movie, named The Heart Surgeon, a drama directed by Audrey Cooke and aired May 1997 at BBC. Following this, the auditions for The Full Monty... and he gets his part on the film. Addy has a London apartment but lives with his wife in York, where he grew up. On Star World, he stars in the sitcom Still Standing, which is about a blue-collar Chicago couple working to raise their three children responsibly and not lose sight of their own youthfulness. After 17 years of marriage, high school sweethearts Bill (Mark Addy) and Judy Miller (Jami Gertz) still make each other laugh and try to keep their marriage intact, even when their family pulls them in different directions. Judy's unmarried sister, Linda (Jennifer Irwin), butts heads with Bill, and the Millers' precocious teenage daughter, Lauren (Renee Olstead), thinks her parents are uncool. Meanwhile, their uptight, studious son, Brian (Taylor Ball), is just discovering girls, and their youngest child, Tina (Soleil Borda), would prefer to run around naked. In addition to spending time with his family, Bill spends a good deal of time with his best friend, Danny Fitzsimmons (Joel Murray), who is working to raise his own son, who happens to be gay. Since Bill has a far more immature approach to marriage and raising children than Judy does, they work at striking a balance and remembering why they love each other, quirks and all. So there you have it, three men who play a sizeable (pun intended) role in making you laugh. Their Own Paper: The Clemens family started a local paper called Hannibal Journal elder brother Orion Clemens took charge as Editor. Sam was the unpaid compositor and by age sixteen he was writing newspaper sketches. In 1852, several of his sketches were published in Philadelphia's Saturday Evening Post. Piloting Mississippi River: From 1857 to 1861 he worked on Mississippi steamboats, advancing from cub pilot to licensed pilot. Captain Horace Bixby was his guru. Marion Rangers and Journey to the West: Samuel joined a volunteer militia group called the Marion Rangers, but it didn't last long-the group was disbanded within two weeks. So in the summer of 1861, Samuel went with his brother, Orion, to the Nevada Territory, in a stagecoach. Orion had been appointed secretary of the new territory by President Lincoln and Samuel went to work for him. In 'Roughing It' Mark Twain gives us the story of the overland journey made by the two brothers, and a picture of experiences at the other end --true in aspect, even if here and there elaborated in detail. Almost immediately after their arrival, Samuel became involved in mining. He tried his luck at some of the so-called most promising prospecting regions, like Aurora and Esmeralda. However, Samuel failed to make a fortune at mining, so he went to work at a quartz mill. Becoming Mark Twain: When he was summoned by Joe Goodman, owner and editor of the Virginia City Enterprise, to come up and take the local editorship of that paper. He had been contributing sketches to it now and then, under the pen, name of "Josh," and Goodman, a man of fine literary instincts, recognized a talent full of possibilities. This was in the late summer of 1862. Clemens walked one hundred and thirty miles over very bad roads to take the job, and arrived way-worn and travel- stained. He began on a salary of twenty-five dollars a week, picking up news items here and there, and contributing occasional sketches, burlesques, hoaxes, and the like. When the Legislature convened at Carson City he was sent down to report it, and then, for the first time, began signing his articles "Mark Twain," a river term, used in making soundings, recalled from his piloting days. Marriage: With his marriage in 1870 to the 25-year-old Olivia Langdon, Clemens' life took a dramatic turn toward stabilization and normalcy. The couple settled down in Buffalo, N.Y., in a house bought by Livy's father Jarvis Langdon, and Sam worked on the Express as editor. He also wrote a monthly column for the Galaxy, a New York literary magazine. Besides all of this activity, Clemens contracted to write Roughing It, an account of his experiences in Nevada and California. They had three daughters, Clara, Susie and Jean. Most Creative Period: At this time, Sam began tapping into his youthful experiences in Hannibal as material for some of the most famous novels in his catalogue The Adventures of Tom Sawyer, published in 1876; Life On The Mississippi, 1883; and Adventures of Huckleberry Finn, 1885. The family spent a year and a half in Europe, in 1878/79, in order for Sam to collect material for a travel book, which resulted in 1880's A Tramp Abroad. A year later, The Prince And The Pauper was released. This was Clemens' first attempt at writing historical fiction with a serious theme, a marked departure from the humorous books of his earlier career. Another classic historical novel, although more satirical, was A Connecticut Yankee In King Arthur's Court, released in 1889. Gone With The Halley's Comet: Clemens' health rapidly deteriorated after Jean's death. In January 1910, he went to Bermuda for his health, but sensed that he wasn't to live long. On April 21, 1910, Clemens sank into a coma at his Stormfield Mansion. At sunset, his heart failed and he died in his bed. He was 74 years old. On April 23, a large funeral procession was held in New York City, and a service was held at the Presbyterian Brick Church. Clemens was buried alongside his wife and children at Woodlawn Cemetery, in Elmira, N.Y. In November 1835, at the time of Clemens' birth, Halley's Comet made an appearance in the night sky. Strikingly, the comet's next appearance came during April 1910, the period of Clemens' death. Throughout his life, Clemens said that he would "go out with the comet," knowing the 75-year span between the comet's appearances. His prediction turned out to be amazingly accurate.